Hello and welcome back to Three Money Methods! This is Jonathan Kraft and I wanted to take a quick minute to show you the difference between Adwords and Adsense. I think a lot of people are very confused about this and that’s ok; you’re just getting started with this or maybe you’ve been around for a while but not really familiar with what goes on with Adwords versus Adsense. Adwords, the idea of Adwords is … let’s say this is your website here and you want to drive traffic to your website. Lots of different ways you can do that but one of the ways is Adwords. Adwords run in a few different places; they either run on Google or they run on what’s called the Content Network. So let’s say you have a website and you want to bring traffic in, you go to Adwords and say “hey, I want to bring traffic into my website” and they say “ok great, why don’t you run some Adwords. Tell us if you want to put them just on Google or if you want to put them just on the Content Network or if you want to put them both places and we’ll be happy to do that for you.” So that brings traffic into your website. So Adwords is really a way to bring traffic into your website. Google comes around and looks at the webpage and says, “I think your website is about …. dogs.” And they go back into the database of advertisers who are running ads with Adwords and they place those ads in the spaces on your website so that those advertisers can get relevant clicks from your website about dogs. There are some advertisers who want to run advertisements about dogs. Let’s say somebody comes to your website and they click on this ad here, they pay Google one dollar and Google, depending on the ad and a whole bunch of other stuff, Google might pay you .30 to .50 cents of that click because it was because of your website that Google got that click. That’s how Adsense works. Now there are lots of people who make a lot of money with Adsense but the way they do it is by having lots and lots and lots of traffic coming into their website. So that’s one of the key things we work to teach you with Three Money Methods and one of the things I really try to help you learn is how to get traffic to your website; so regardless if you’re doing Adsense or running banner ads or any other method really on your website, you really need traffic coming into your website in order to profit from a program like Adsense. So that’s the difference between Adwords and Adsense. Adwords is a way of getting traffic to your website and Adsense is a way of profiting from the traffic that’s coming to your website. I hope that clears things up. Again, this is a relatively quick video. But I hope that clears things up. If not, please post down below, down below the video here, if you’re on the Three Money Methods site, you’ll see a place where you can actually go and post a comment here. Just ask your questions there and we’ll try to answer them either in a future video or I’ll try and come through and answer them in the comments here. Thank you very much for taking the time to visit ThreeMoneyMethods.com. 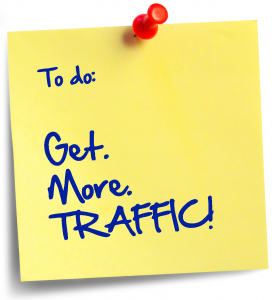 Please come back for our Traffic Tuesdays where we are going to be teaching you how to get lots of traffic to your website so that no matter how you want to make money, there are three ways to make money from your website. So in this case, what we’re talking about is selling ad space on your site – that’s what Adsense does. One way you can bring traffic to your website is through Adwords but you profit from people who are running ads in Adwords by selling the ad space on your site as an Adsense “publisher” basically using that space to generate profit and to also generate leads for people running ads in Adwords. If you have any questions, again please feel free to ask them below the video here and we’ll look forward to seeing you back here again at ThreeMoneyMethods.com. Welcome back to another edition of Three Money Methods Traffic Tuesdays. I’m your host Jonathan Kraft. And I thought, well there are all these other great people out there who are talking about Adwords and know way more about it than I do, but I’ll do one anyway, just to help people maybe try and break it down really simply. I’ve also posted a video right below here (from Google actually) about how Adwords works. Adwords — (my understanding of Adwords anyway) and ways to bring traffic to your websites. So you have a product or a service – let’s pick an actual, real-world example; so let’s say you sell wallets – I don’t know I’m just making this stuff up! But let’s just say you sell wallets. So if I’m looking for a wallet on Google or wherever, I might go in and type in the words, “leather wallet,” “women’s wallet,” “men’s wallet;” a whole bunch of other stuff. I may use all kinds of keywords to describe what I’m looking for. One of the very cool things, I just moved this to the left here because I think it’s going to work better over there, one of the very cool things about internet technology that is so different than any other sort of advertising that existed before it is that you can target the person who’s looking for wallets. You can make an ad specific to the person who’s looking for a leather wallet. You can make an ad specific to the person who’s looking for a women’s wallet. You can make an ad specific to the person who’s looking for a men’s wallet. These are different kinds of customers. That kind of person is going to have a different sort of reaction to this page, if you have different pages on your website, is going to have a different kind of reaction. So for example, a women’s wallet or a men’s wallet – if you have an ad advertising men’s wallets to somebody looking for a women’s wallet, that’s not going to work. So you want to have a specific ad that is targeted to someone looking for a women’s wallet and a specific ad that is targeted to someone who’s looking for a men’s wallet. So your ad would be here; you would take those people to different kinds of landing pages; because if I’m looking for a men’s wallet, you don’t want to take me to your general wallets page. If I’m looking for a women’s wallet, you don’t want to take me to your men’s wallet page, right? You want to take me to a specific page that’s targeted to what I’m looking for. What Adwords allows you to do is to write ads that are targeted to specific keyword searches and then send those people along to pages that are specific to what they were looking for to begin with. It’s a really cool system and a really cool setup. Which one of those sets of copy are they most likely to respond to? You can test all of that stuff inside of Adwords. It’s just amazing the amount of things that you can actually test to see what works. And then yes, you pay every time someone clicks on your ad and goes to your webpage; you pay per click. That’s what’s called Pay per Click marketing, PPC marketing. Adwords is a form of Pay per Click marketing. There are other kinds of things that you can do inside of Adwords as well. But just to give you a basic overview, this is how Adwords works. So let’s look for men’s wallets. So it’s probably more likely, if I searched for “men’s wallets,” that my ad would be more likely to be clicked on if I actually used the keywords they used when they were looking in the search results (whoever was looking). “Men’s Leather Wallets” at Wallet Gear: “Hard to find men’s wallets for the guy on a budget.” That probably gets pretty good click-through. They may not be at the top of the search results because they don’t want to be at the top of the search results. The people who are at the very top of the search results are (generally) paying the most and may not be getting the most return for their money. My guess, based on just looking at these because it’s got the most stuff around it, they use Google Checkout, they have a $5 off deal here because they use Google Checkout, and this ad is probably getting the most clicks. Let’s go back and do one more search here just to show how this targeting could actually work. Let’s look for “women’s wallets” and see what else comes up. I don’t think that if I’m looking for “women’s wallets” this is what I want. I’m not sure why J.Crew is coming up in the number 1 spot; probably because they’re bidding the most. They’re probably paying too much per click and they’re probably not getting targeted customers coming to their page. Tusk.com – again, they’re running an ad for “Men’s Designer Wallets” when I Googled “women’s wallets.” Am I likely, as a woman, to click on this ad? Probably not! So they are doing a bunch of different things in that ad; we’re not going to go through all of that. But you can see that if you target an ad to a specific kind of search, you’re going to get better results. I don’t want to click on any of these advertisers, but I would like to show you some advertiser’s landing pages. We’re going to go to the LizClaiborne.com/wallets just to see what’s on this page. But remember, I looked for “women’s wallets” and this is the page that I’m ending up on. What’s fascinating is … check this out! I go to the display URL that they had in their ad, LizClaiborne.com/wallets … “sorry, this page cannot be found.” If I had actually clicked on the ad, sorry Liz Claiborne, I’m going to cost you some money; we’re actually to go see what page this takes them to. I’m going to click on this ad and see what page it actually takes them to. But shouldn’t they have their display ad actually take you to a page? I just typed in the URL; anyway, whole other topic! The point of this is to go into a very specific topic about women’s wallets. But why wouldn’t they call this page, “Women’s Wallets,” and have a page specific to the keyword term “women’s wallets;” so that when I’m on this page, the first thing I see is wallets for women! And maybe Liz Claiborne only sells wallets for women, I really don’t know. But you can target specific to the market that you are trying to attract and you can then sell very well to a specific market based on actually targeting the keyword search from the beginning. You can target “leather wallet” or “men’s wallet” or “women’s wallet” or whatever is in your market. Google gives you all kinds of tools to help you generate massive lists of keywords. I’ve put a couple of videos right below the video here to help you understand Google Adwords as well as a couple little tips. I think I put a video here right below from Glenn Livingston about how to find your keyword ad groups. But this is basically the idea of how Adwords works. I hope you understand Adwords maybe a little bit differently, or a little better than you did before. Please come back and visit us next week; I’m going to talk about something I know a little more about which is actually getting traffic to your website through a variety of different methods and getting free traffic to your website! So we’ll be talking about that next week in Three Money Methods Traffic Tuesdays. Thank you very much for visiting us at ThreeMoneyMethods.com!